-The Nike LunarGlide+ is the first running shoe to deliver both top-tier cushioning and as-needed support with the new Dynamic Support system. -The Dynamic Support system in the Nike LunarGlide+ mid-sole is comprised of a lightweight LunarLite foam core that sits within a firmer foam carriage. The LunarLite foam core is cut to fit into the carriage at an angle creating a deeper cushioned lateral side. The medial side of the Nike LunarGlide+ mid-sole features a rear-foot wedge that has been contoured into the firmer foam carriage which provides stability on an as-needed basis. -The Dynamic Support system delivers great cushioning for neutral runners, as well as the necessary support for runners that overpronate. This makes the LunarGlide+ appropriate for a remarkably wide range of runners. -Nike designed Flywire technology into the upper to provide the necessary support with a dramatic reduction in weight versus a conventional, overlay-based upper construction. -The men’s LunarGlide+ provides the cushioning, support and durability necessary for daily distance training in a lightweight, 10.6 oz package. -The breathable mesh upper provides comfort, protection and durability. -Soft yet strong microfiber synthetic overlays are ultrasonically welded in place for targeted support and luxurious, seam-free comfort. -The men’s Nike LunarGlide+ features a gender-specific external heel counter for exceptional comfort, fit and support. It is formed as a curved, external piece to more effectively retain its shape than a conventional internal heel counter, which is traditionally built into the shoe as a flat sheet of material. 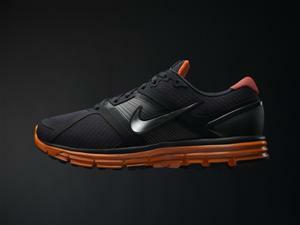 -Nike Flywire technology boosts support and lockdown around the midfoot, while reducing weight. -A high-resilience foam sockliner with men’s-specific geometry provides exceptional step-in feel and added support. -Reflective elements add peace of mind in low-light conditions. -The Dynamic Support system delivers great cushioning for neutral runners, as well as the necessary support for runners that over-pronate. This makes the Nike LunarGlide+ appropriate for a remarkably wide range of runners. -The Nike LunarGlide+ features an Archbridge specially designed for men that cups the midsole along the arch side of the rear-foot for added support without sacrificing a smooth transition. -The rear-foot crash pad is made of BRS 1000 carbon rubber for maximum abrasion resistance. -The entire outsole features next generation Nike Natural Motion engineering – informed by the Nike Free line of shoes – to encourage a smooth, efficient stride. -Deep flex grooves specially designed for a men’s foot are aligned along the length and width of the outsole mirror the grooves in the midsole to promote a smooth, efficient stride. Sounds like an extremely well designed running shoe. I’ve noticed that you feel the lack of cushioning in the heel area if you run a lot — the external heel counter should help.